How do I add a project feed to my RSS reader? / Project Management / How do I add a project feed to my RSS reader? 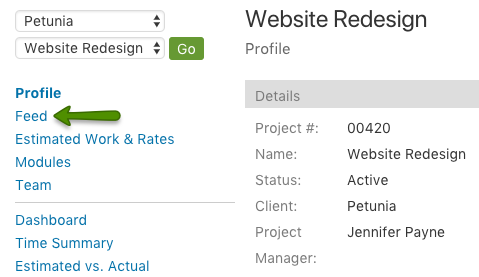 Each Intervals project has a feed that is updated whenever a milestone, task, document or other project asset is added or updated. This feed is also available as an authenticated RSS feed. To add the feed to your favorite RSS reader, first make sure the reader supports authentication RSS feeds. The following instructions apply specifically to FeedReader, which we recommend using for Intervals, but most RSS Readers should follow a similar setup. Other RSS readers known to work with Intervals authenticated RSS feeds are Internet Explorer and NetVibes. Log in to your Intervals account and navigate to the project you want to subscribe to and click on the Feed link in the left column. This will bring up recent project activity. Right-click on the RSS icon in the upper right corner and select “Copy link address” (or “Copy Shortcut,” depending on your Web browser). Open up FeedReader and click the “New” button to add a new feed. 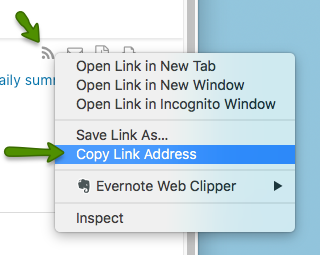 The URL should auto-populate from the system clipboard. If it doesn’t, paste the Intervals URL for your project management RSS feed into the text field and press enter. 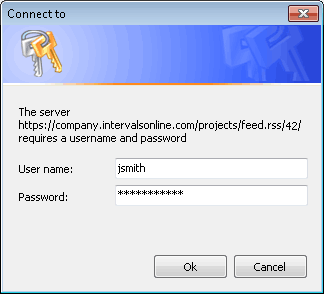 RSS feeds from your Intervals account are secure and will prompt FeedReader to ask for a username and password. Enter your Intervals login credentials in the popup window that appears. That’s it! Use your RSS feeds from Intervals to stay up-to-date or get caught up on any of your projects.